Scottish football can be stultifying, it's been over a decade now since the SPL champions faced two promoted sides over the course of their title defence. Celtic, already a part of Ross County's elongated unbeaten league run, welcome Dundee today. A lot of people backed Dundee to return immediately from whence they came. They'd finished a distant second in the First Division and then spent a strange summer as victims of the rancorous paralysis that stupefied the game. Were Rangers in or out? Rangers were out. Were Dunfermline back in or were Dundee promoted? Dundee were up. By the time we'd worked out what was happening it seemed like Dundee were to be rewarded with an SPL spot but punished by not having time to adequately prepare. 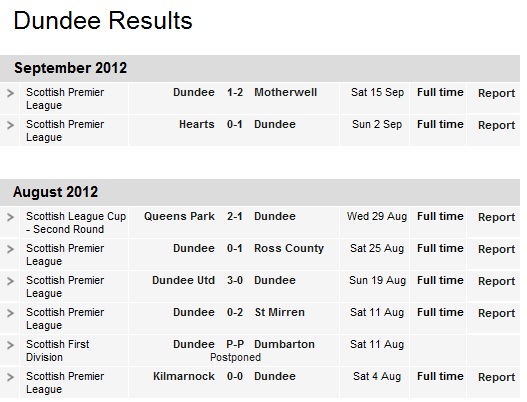 The BBC website even lists their opening day First Division fixture as being "postponed." And there they sit, offering succour to the "told you so-ers," at the foot of the table. An opening day draw at Kilmarnock and a 1-0 win at Hearts are the only points gained in six games. Four points from three away games - they were well beaten in the derby at Tannadice - isn't a bad return. But three defeats at home will worry Barry Smith. Against Ross County and Motherwell they lost goals in the last twenty minutes of games that cost them the match. Obviously it's far too early to discern any sort pattern. And if Dundee's start has been stuttery, they are far from alone. Nine clubs are within five points of them in a league that is steadfastly refusing to be taken by the scruff of the neck. Celtic find themselves among that batch after five league games when they've often looked bothered, sometimes bewildered but very rarely bewitched. Five league games have delivered just eight points. That's far less than is expected of Celtic in seasons when they're predicted to be in a title fight, let alone a season touted as their great SPL walkover. Maybe the players were expecting it to work out like that and are consequently lacking the focus they need. There are injuries, of course, but also a lack of resolve and confidence in some of those who are fit. A 0-0 draw with Benfica on in the Champions League on Wednesday featured an improved performance but hardly an inspiring one, particularly in a group where snaffling wins at home looks a minimum requirement. 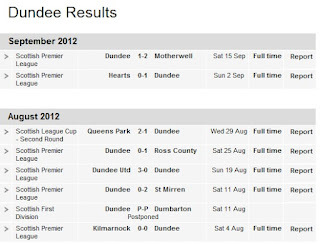 All of which might mean that Dundee are less scared of a trip to Celtic Park than SPL new boys often are. Manager Barry Smith will talk of keeping it tight at the back and starting well - although Hibs at Celtic Park and St Johnstone at home last week have shown that neither is a necessity to get some sort of result against the champions so far this season. While one would expect Celtic to score - they've found the net in every SPL game so far - their defence is not without a certain largesse. In five league games only Aberdeen have failed to score against them and Inverness, Hibs and St Johnstone have helped themselves to two apiece in the last three games. The willing have found that there's goals for the taking. Which might set the Celtic Park stage for Colin Nish. He broke his nose scoring his first Dundee goal last week but should play today. It was worth it though as it took him to joint eighth in the all-time SPL scoring charts. It will probably make him better looking into the bargain. He's now on 63 goals, level with Chris Sutton and Stevie Crawford. Quietly effective. I've liked Nish ever since I saw him in a corner shop after one of his less quietly - or indeed, noisily - effective performances for Hibs. I still had my scarf on. He, rather touchingly, was still wearing his club tracksuit and looked just as miserable as me. Our eyes met briefly, we both decided nothing needed said and so spent what seemed like an eternity staring at the floor as the girls at the front of the queue bought enough Lambrini to sink a gaggle of geese. Hibs fans don't always have more fun. He's at 10/1 to score first tomorrow. Or, for the chicken-hearted, 10/3 to score anytime. It could be that Celtic will be suffering what we're duty bound to call a Champions League hangover tomorrow. Realistically though I expect them to start winning games like this. And I expect them to start winning them tomorrow. Dundee's best hope: a 1-1 draw that you can back at 14/1. Best hope? I think so. This looks the sort of game where Celtic can stop stuttering. Neil Lennon has talked about freshening the team up to combat that European "hangover." So Celtic to win 2-0 with Tony Watt as first scorer at 20/1. Or, if you prefer, 3-0 at the same price. Mind you, if you fancy a crate of Lambrini, why not go crazy on a 3-1 Celtic win with Colin Nish as first scorer. 125/1. A foreign bloke in branded leisurewear having a smoke outside Glasgow's Radisson can only mean one thing. There's a football team in town and one of the coaches is plotting the downfall of some of our brave boys while looking as effortlessly cool as it's possible to look while indulging in a pastime that runs the very real risk of setting his Adidas training gear alight. The studied nonchalance on Argyle Street has belonged to Benfica this week as the Champions League group stages return to Celtic Park. Celtic revel in nights like this: 18 home games in the group stages of this competition have seen them claim 13 wins and suffer just one defeat. If their Champions League campaigns haven't always brought sustained success, achieving parity with the great and the good of the European game has rarely been a problem at home. But Neil Lennon is facing something of a conundrum before this evening's match. Celtic predicted canter in the one horse SPL has started groggily. A meek defeat to St Johnstone on Saturday confirmed the worst start to a league season for over a decade. Lennon suggested - and it was a chagrined suggestion - that thoughts of this Benfica clash might have played a part in Saturday's defeat. Others have suggested that the players might be taking time to adjust to a league shorn of their rivals. I might also question the wisdom of that Philadelphia friendly with Real Madrid after the league had started and when both the domestic season and the squad were already facing disruption for the last round of international fixtures. More prosaically there have been injuries and what appears to be a collective loss of form among a few key players. The manager will expect his squad to rise above that in the SPL but he'll also be concerned how this lacklustre start will translate into European performances. In the parlance of such things he'll be looking for a reaction tonight. Without it Celtic could be in for a long evening. The bookies would seem to concur. Celtic are 13/5 to win with Ladbrokes while Benfica are 11/10. Domestic form, the depth of the two squads and Celtic's four years absence from this stage would certainly explain those odds. But they do seem to disregard the Celtic Park factor, the home advantage that so defines Celtic's European adventures. The draw is quoted at 9/4 although the generosity of Celtic's defence so far this season would scare me off 0-0 at 6/1. 1-1 at 7/1 might well look the better bet. I'm also happy to be influenced by the Craig Levein Equation: Craig Levein + Craig Levein questioning Player X's value to the Scotland squad = Player X doing something impressive. In this case Kris Commons (Scotland's ninth best midfielder. Or is tenth best?) scoring first in a 1-1 draw comes in at 40/1. Have a punt on that. By the end of the night you might be just be singing Levein's praises. It's become the vogue in Scottish football to declare the game - perhaps more accurately its administrators - as a "laughing stock." That always seems a bit of stretch to me, this idea that people outside these shores care enough to chuckle. Care enough to even think about us that much, other than a feeling of mild relief when they draw one of our clubs in Europe. No, we've probably slipped beyond being continental mirth makers. Even longer has passed since we were pioneers of the game. Some have found that hard to accept. I recall in the early days of the SPL split various corporate evangelicals trying to sell an alien concept to fans with assurances that Scotland was blazing a trail. Where we explored an unnatural breach in the league season so others would surely follow. The avalanche never came. Scotland persevered but the world was unmoved. And still the English media struggled to get to grips with the essential contrivance of our league table as the post-split games threw up the odd anomaly. But, like a reward for the most indefatigable of Victorian missionaries, distant converts have finally been delivered. South Korea's K-League has adopted the "Scottish model" as part of a plan to revolutionise the domestic game. Previously a 16-team league without relegation, the K-League was struggling along with a flabby belly of meaningless fixtures. The result was supporter apathy and, rather more seriously, an open invitation to match fixers. An investigation last year ended with 60 players and coaches being indicted for accepting money to fix games. A desire to cleanse the game through revolution led a Korean delegation to Scotland - accusations of our own corruption have perhaps not carried across continents - and the adoption of a league split. A different model though. 16 teams will play home and away before splitting into two groups of eight. They'll play home and away again - the March to December season takes in 44 games - to decide the champions and sort out the newly introduced relegation places. The architects of the plan hope this tartan tinge will spark a fightback against sports like baseball and defeat the nefarious influences with their bulging envelopes of bungs. There have been some bumps in the road. Military team Sangju Sangmu have announced that they will refuse to complete their final 14 fixtures after the league authorities decided they would be relegated at the end of the season. The club uses players who are completing their national service. When their two years in the military are up the players return to their original teams. That means they're not officially contracted to Sangju Sangmu. And that's against K-League rules. Already Korean football is discovering that league splits and contractual complexities are not mutually exclusive. A further fact finding mission to Scotland might not have gone amiss. But the split is in place. The K-League expects at least one team in every fixture to have something left to play for. "The European league system is a little boring. Like capitalism, [the split] is not a perfect system but it works for us." A sentiment that will surely be sympathetically echoed in the corridors of Hampden.